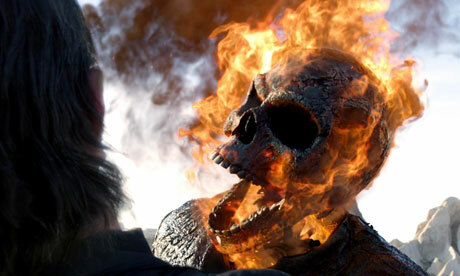 Does Ghost Rider: Spirit of Vengeance redeem the franchise or cast it further into reboot hell? Note: major plot spoilers ahead! Ghost Rider: Spirit of Vengeance is a weird movie. Unlike the zaniness of The Dark Backward or even the mother of weirdness Begotten, GRSOV gives off the strange party-guest-who-holds-up-the-wall vibe than offering something truly unique. From the outset, you realize that this sequel to the 2007 yawn-fest wants to be different, recognized, and respected. After the first Ghost Rider was plagued with mailed-in performances and an action-heavy script, a new team was brought in, led by directors Mark Neveldine and Brian Taylor. These guys are better known for 90-minute action films (Crank, Crank: High Voltage) than for their abilities as cinematic heavy-hitters. Add to the fact that GR was financed by the relatively unknown and second-tier Abu Dhabi Media (The Double), and everything seems uniquely out of place. The result is a film that falls short from the start and barely reaches anything above a pulse worth measuring. 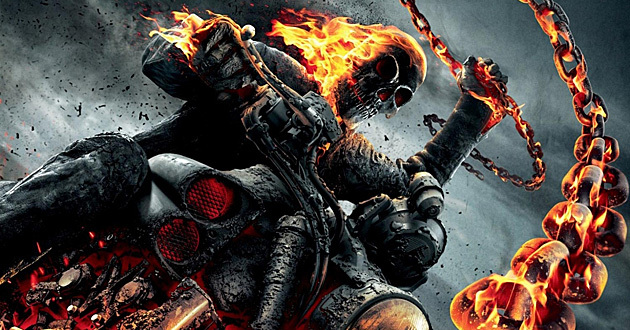 The plot is fairly simple: Johnny Blaze (Nicholas Cage, Raising Arizona) wants the soul-sucking Ghost Rider out of his system. 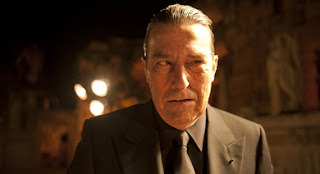 Enter a priest (Iris Elba, Thor) who promises to do just that if Blaze will help rescue a boy with magical powers who is to be sacrificed by the Devil (Ciarán Hinds, Tinker Tailor Solider Spy), thus making the dark lord all powerful on earth. This will, of course, bring a smashing end to all things Earthly, as the Devil will assume the boy’s body, making him immortal, and plunging the Earth into darkness. Yeah. It’s not long before the film descends into tired clichés, punctuated by silly, unnecessary one-liners and therefore adhering to the worst of modern cinematic sin: that CGI can save a movie when errors of story are present. This point is proven true at several moments throughout the film, as Cage struggles to separate his identity from that of the Rider, then learning he’s carrying an assassin angel under his leathers, only to get Rider back just in time for an unappealing and flat climax. There are many unconvincing aspects about Ghost Rider: Spirit of Vengeance which present unavoidable and destructive consequences for the film. Poor casting decisions (particularly with the boy and his mother) along with failure to use talent effectively pop up in several key sequences. Even the appearance of Christopher Lambert (Highlander) as lead priest near the film’s end is just not given enough screen time. Lambert’s unique presence could have upped the ante, providing greater character conflict for Cage; but their scenes together feel rushed which ultimately kills any pseudo-cameo feeling. Johnny Whitworth’s bad guy is only moderately appealing, even when the Devil pimps his ride, turning Whitworth into a lethal flesh-eating hitman. There’s simply no incentive for the audience to love these characters, and the funny scenes (Blaze’s urination sequence is pretty good) are too few and far between to be relevant to the story. Did someone fart up in here? Oh, it's the movie that stinks. However, the film is visually appealing, with directors Taylor and Neveldine bringing their Crank sensibilities and merging those with some neat anime sequences at the beginning and middle of the film. There is an insightful behind-the-scenes short featuring the antics of the directors, currently featured on YouTube that is far more interesting than anything in this film. Some of the wire acts to get Taylor into shot are as detailed as the actual stunts themselves. Even with all this effort, Taylor and Neveldine are not kings of silver screen drama, but they can only do so much with a 95-minute script that arrives spun out on the side of the road. Finally, a notice to Hollywood: stop post-producing 3D. If you cannot afford the cameras at the time a film is shot, then drop the concept. GH's post-3D treatment is unnecessary and actually gets in the way for those of us sporting glasses. If you're like me and see 3D as an inconvenient distraction, then save your money and either see the film in 2D or skip it altogether. GRSOV will make good money in its first week. Cage fans will see this, because that's how Cage fans are. But the film doesn't have enough to survive in theaters for very long. Expect both a serious falloff after Week 2 and talk about a reboot soon after. It’s no wonder that critics were discouraged from posting reviews prior to its release, and serves proof that Marvel’s spinoff group, Marvel Knights, needs more focus and better storytellers before it can compete. Your time would be better spent getting ready for The Avengers by re-watching that franchise and waiting for Ghost Rider: Spirit of Vengeance to show up soon on video. After February, this one might be hard to find in theaters.